A visit by a team from Bureau VERITAS on June 30, 2011 endorsed SABIS® IT Department’s acquisition of ISO 9001:2008 certification. This achievement was further corroborated with the issuance of an official certificate by Bureau VERITAS on July 27, 2011, with which SABIS® IT department joined over 350,000 companies around the world registered to ISO 9001. 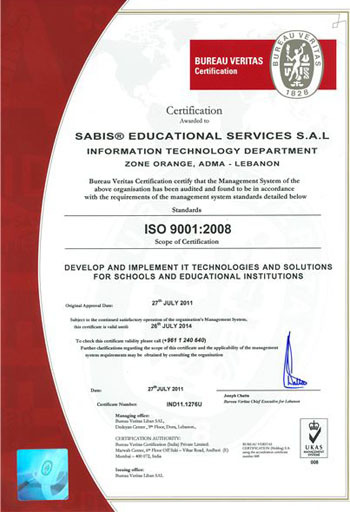 The certificate states: “The management system of SABIS® Educational Services, IT Department has been audited and found to be in accordance with the requirements of ISO 9001:2008.” The scope of certification is that SABIS® Educational Services, IT Department can develop and implement IT technologies and solutions for schools and educational institutions. SABIS® IT Department’s quest for quality assurance started way back when it sought CMMI process improvement in 2008, culminating in the acquisition of Maturity Level 3 rating in July 2010. The quest continued with the initiation of ISO9001:2008 certification in February 2010. Since then, SABIS® IT Department has been completely engaged in aligning its processes to ISO standards in four areas: Software Development, IT Infrastructure, IT Operations, and HR related to the IT. Regular audits were held to measure how the quality system is working and to check that everything is in reasonable shape for the upcoming ISO certification. Following this certification, which will remain valid till July 28, 2014, several internal audits will be carried out throughout the year, along with one surveillance audit to make sure that the IT Department's quality management system is in order. ISO 9001:2008 certification is a testament to the fact that SABIS® IT Department has in place systems and processes to ensure that product and services are delivered effectively and in a controlled and repeatable manner. As such, SABIS® IT department will be able to enhance customer satisfaction and structure continual improvement to gain a competitive edge in the educational technology arena.